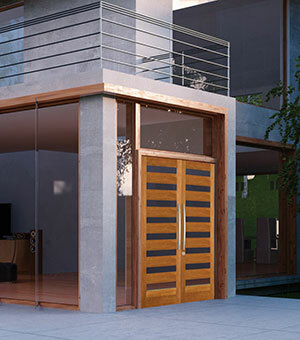 View our entire Contemporary Exterior Doors section in our online catalog. 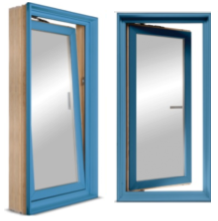 JELD-WEN has revolutionized the wood window and door industry by inventing technology that creates longer lasting, more reliable wood products. This is a major hit with today’s growing market looking for green and sustainable solutions. AuraLast Wood is JELD-WEN’s secret to longer-lasting wood due to an exclusive manufacturing process that creates a shield of protection against wood rot/decay, termite attack and water saturation. This leading-edge technology is designed to distribute active ingredients into the very core of the wood for virtually 100% surface to core protection. That means, even if the surface of the wood is compromised by saw cuts, nails, screw holes and other finishing processes, AuraLast Wood will still be protected. This protection allows JELD-WEN to offer an industry leading 20 year limited warranty on pine wood windows, patio doors and exterior doors and a limited lifetime warranty on exterior door frames and trim boards manufactured with AuraLast Wood. Fewer toxins: JELD-WEN uses a closed-loop, water-based solution process to manufacture AuraLast Wood, which reduces harmful, volatile organic compounds (VOCs) by 96 percent compared to the industry standard method of submersing wood into harsh petroleum-based treatment solutions. Longer lasting products: Manufacturing products that last longer means less waste going into landfills and more efficient use of our natural resources. Locally sourced: All JELD-WEN AuraLast Wood products are made in the United States. That means the products travels shorter distances to the final home destination. This significantly reduces fuel consumption and its impact on the environment. 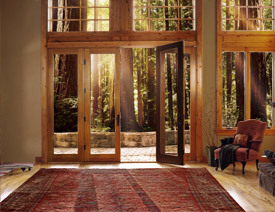 Less waste: Because JELD-WEN manufactures the most extensive lines of doors and windows, the wood by-products are recycled and used to make a variety of other JELD-WEN wood and wood composite products.